While Singapore and Malaysia is one bridge away, but the prices of the petrol is greatly different as such there are many Singaporeans whom travel all the way into Johor Bahru to grab a bite, polish their cars and fill up their petrol tanks. A full tank in Singapore is almost equivalent to 2 times full tank in Malaysia. The Singapore government realized that this might caused a long term issue in the petrol business in Singapore and the customs pass down a new law to prohibit Singapore registered cars to fill up much of their tanks. 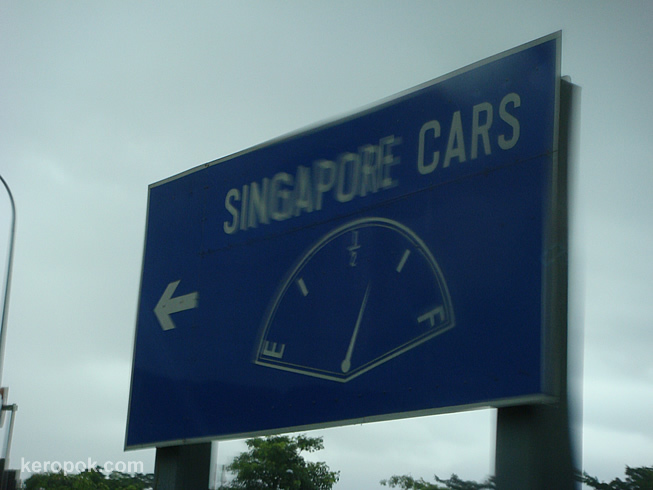 The new law requires Singapore registered vehicles to be at least three quarter full before allowing into Malaysia. Though the custom does not really checked all the vehicles, but they will prompt a spot-check now and then on vehicles that looks suspicious. If you are found to have your fuel tank below the requirement, you would need to turn back into Singapore inland to fill up before gaining entry to Malaysia’s borders. There are also cases that some drivers uses “special gadgets” which act like a switch to “tune” the fuel meter to always 3/4 tank full. But of course there are pros and cons to it. The pros is that you are able to fill your fuel with more cheaper fuel after you have entered into Malaysia. The cons ? You might be caught by the custom officers and maybe have to pay a heavier, or you would forgot to switch off the “special gadget” and ended yourself up somewhere on the highway before you realised that you have finish all your fuel.